From romantic al fresco spots on the sand to trendy urban diners, hotel restaurants in Lombok serve up a range of tastes and ambience. Generally you'll find menus covering a broad range of international and local delights, although many specialise in authentic Italian or Chinese fare.Lots of beach hotels and villas also focus on fresh seafood with lively buffets and bbq nights for every budget. Quah is a lovely and relaxed restaurant, part of Qunci Villas, that sits by the beach-front. Wooden décor fills the dining location which is lit up beautifully at night. Dine on delicious seafood at Quali, a spacious and popular restaurant. 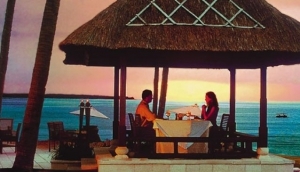 Facing the sea, this peaceful dining spot boasts a beautiful location and high quality cuisine too.